So Caedmon was potty trained at 21 months. But we’ve had a little issue with the pooping part of the whole process, ie like he won’t go except when he’s asleep during nap or overnight. And so we have tried and tried and tried just about everything possible for the last 14 months. He even gets a little constipated so we push fluids and fruit and natural constipation remedies. He’s a pro at #1 and goes without a problem. Still can’t make it all night being dry, but I don’t expect that yet. However the poop thing I’m kind of over. I’ve tried going weeks without mentioning it and then weeks where we try every hour. We have charts with stickers on the wall, new underwear hanging on the bathroom wall, presents wrapped up for when he goes, and M&Ms in a container waiting. I’ve read books, scoured the internet, read blogs. Nothing seems to work. Early this past week I told him, “Caedmon you need to learn how to go poop in the potty so that when Edric gets home you can show him.” He seemed real excited about this. He told me multiple times that day how he was planning on showing Edric how to go and how he was going to be a big boy. And on Wednesday we had success! And he got to choose underwear off the wall, put up a sticker, get 3 M&Ms, and open a new Thomas train. He was so proud of himself and we all gave him hugs and high fives and made a big deal out of it. And then came Thursday. 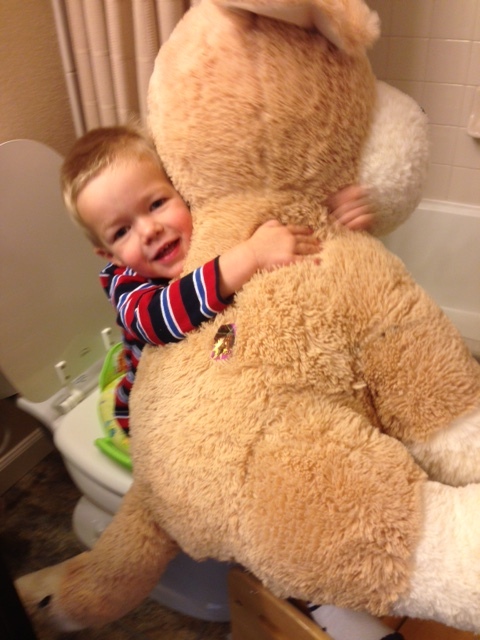 “Caedmon, let’s go poop in the potty”. To which he replied “No, I wait till Edric comes home.” And with the way the adoption process goes that could be a number of months from now…..I think he missed the point. I told him that we need to practice going EVERYDAY, and so he tried a few times with no success. And on Friday I said “Caedmon remember big boys go poop in the potty every day.” He answered me “Remember I am a big boy already.” For being 2 ½ he’s awfully smart! We tried again multiple times today with no success. And so in many ways I’m still back in square one waiting for #2. Oh well, he will do it when he’s ready, and I will probably continue to stress and worry about it, but it will happen. In the meantime I will take one day and multiple attempts at a time.